Audible returned to the races for the first time since his third-place finish in the Kentucky Derby on Breeders' Cup weekend, winning Saturday's listed $200,000 Cherokee Run Stakes at Churchill Downs. 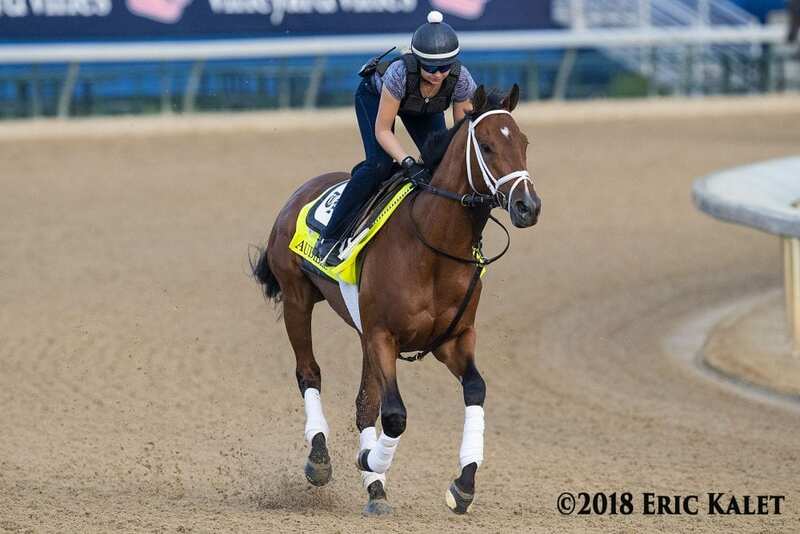 Trainer Todd Pletcher indicated that the 3-year-old son of Into Mischief would be aimed at the Pegasus World Cup on Jan. 26, and told drf.com that the next step toward that goal would come in the Dec. 15 Harlan's Holiday Stakes at Gulfstream Park. The colt required time off after his Derby effort, Pletcher relayed. Prior to the Run for the Roses, Audible captured the G1 Florida Derby and G2 Holy Bull. This entry was posted in NL List, Pegasus World Cup, Racing and tagged audible, Breeders' Cup, cherokee run, churchill downs, Florida Derby, Gulfstream, harlan's holiday stakes, holy bull, kentucky derby, pegasus world cup, todd pletcher by Paulick Report Staff. Bookmark the permalink.